The Hunt will be split into different age groups, so all ages get a fair run. There will be a central point in the park for everyone to meet at 4.30pm, before the hunt begins. With excitement levels at their peak parents should be aware that the Easter egg hunt will begin moments after 4.30pm. Please make sure that if you’re coming down for the Easter egg hunt that you arrive on time to avoid disappointment. Join us for a night under the stars run by the Canberra Astronomical Society. With a new moon making for darker skies, this is a great opportunity to look through a telescope at the night sky. Come rugged up in winter warmers and bring along a torch and some cash to buy a warm drink from the coffee van. The Canberra Astronomical Society will set up a number of large telescopes for you to look through, however you are welcome to bring your own as well if you would like. This is one of the last Multi Unit sites available in Moncrieff. Block 2 Section 29 is conveniently positioned next to Moncrieff’s Recreation Park and within walking distance to the proposed Future Community site, Group Centre site and public transport routes. The Suburban Land Agency presents the last chance to purchase a packaged lot of 6 build ready single residential blocks in Moncrieff. Join us for some fun in the park in the school holidays! The Mingle team have been working together with local Moncrieff Residents and ACT Playgroups to bring you Play in the Park 2018. This is a chance for kids to meet other kids and for parents and carers to connect with other families in Moncrieff. Come to support your neighbours and have some fun! Communities from Moncrieff and Amaroo have been physically connected by the newly-built Wagi Bridge, which was officially opened by Minister Berry on Friday 9 February 2018. The Moncrieff Recreation Park is now open! More than 500 locals came together last Friday 8 December when the park was officially opened by Minister Yvette Berry. The park features a number of sporting facilities including a Cricket Pitch, Basketball and Volleyball courts and Ping Pong tables. There is also a learn to ride track, exercise equipment, and a range of different adventures and obstacles that children can explore. Join us for the official opening of the Moncrieff Neighbourhood Park by Minister Yvette Berry MLA and Suzanne Orr MLA. 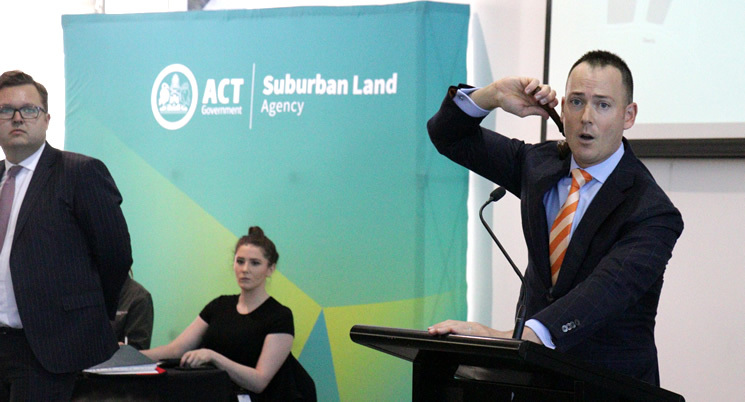 Six Multi Unit sites across Taylor, Throsby and Moncrieff and One Mixed Use site in Thorsby were sold under the hammer at Auction today.